An SUV gives potential buyers the ability to drive a vehicle that offers good gas mileage, cargo space, high clearance, and space. At Toyota Northwest Edmonton, we love to show the features of SUVs to the people in our community. The high clearance and bigger size of an SUV make it a safer vehicle to drive. You can get through tough weather like rain and floods easier when you are higher off the ground. If you have an SUV, it is also easier to get through snow and ice than a car that has low clearance. Your bank account is more comfortable with the lower costs in gas for newer SUVs. You can also fit more people or cargo in an SUV. 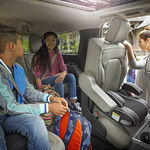 The entertainment features make an SUV a great vehicle for trips. It is easier to be a passenger on long trips with the extra space an SUV provides.